If you're in the mood for a bit of Christmas and winter reading, we've got lots of ideas for you, from Dickens and The Grinch to cosy Christmas crimes! Here are some suggestions. Edward Trayer signs his new children's book The Gullfoss Legends! 18 of December 11 o'clock sharp. New competition! Win a signed copy of famed tattoo artist Kat von D's new book The Tattoo Chronicles. Ms von D is visiting Sweden at the moment to launch her new books. We don't actually have anything planned for her in our shops, but we do have a signed copy of the beautiful new book to raffle off. Just send us an e-mail at info@bookshop.se stating what Kat von D's 'real' name is and YOU could be the winner! Competition ends Sunday December 5. Winners announced forthwith. 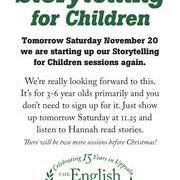 Tomorrow Saturday November 20 we are starting up our Storytelling for Children sessions in the Uppsala shop again. We're really looking forward to this. It's for 3-6 year olds primarily and you don't need to sign up for it. Thursday Nov 18th: All-day celebration in the shop, evening party! The Uppsala English Bookshop 15 Years!!!! Yes! Thursday November 18 is our 15th birthday. Incredible, right? And we're bigger, better, bolder than ever! All thanks to you guys of course. Winner of a signed copy of Simon Kernick's The Last 10 Seconds! So congratulations Phil, the book is in the post. Competition; Win a signed copy of Simon Kernick's The Last 10 Seconds! Win a signed copy of brit crime great Simon Kernick's latest race-against time bestseller The Last 10 Seconds! What is the name of the lecturer in humanities at Brighton Polytechnic who was a major inspiration to Mr Kernick? And, of course, you have to 'like' this post on Facebook! Deadline for this competition is Sunday November 7. Good luck! The answers to the "Signed Salman Rushdie" competition were Lewis Shiner (remember, we should all be reading him....) and Ptosis. The lucky winners are Therese Granlund and Johan Anglemark! Congratulations! Get in touch for desired ink.